In previous versions of our DaVinci Resolve series, we talked about setting up projects and databases, creating a project, and backing it up. Now, you’re all ready for importing your footage. 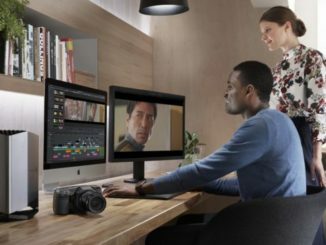 Importing your footage into DaVinci Resolve, is as easy as using a few keystrokes to get your clips into your workflow. Here are some helpful keyboard shortcuts to get between the various pages in Resolve. 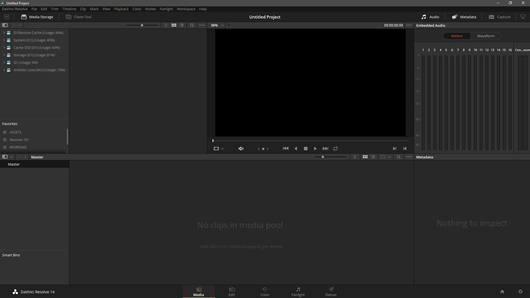 The Fairlight page is new to DaVinci Resolve 14 – thus the shortcut that doesn’t quite fit the trend.So, with your project open, hit SHIFT + 2 or click on the ‘Media’ page icon at the bottom of the screen to open the Media page. This is the place where you can review all your media and make selections to add into you project. BUT – before we do that, let’s have a quick look at our options. There are 2 places in Resolve 14 where we can make decisions about our project. The first one is found either by hitting the keyboard shortcut ‘SHIFT + 9’ or by clicking on the little cog icon at the bottom right of the UI. Incidentally, the little house icon next to the cog will bring back up the Project Manager (SHIFT + 2). 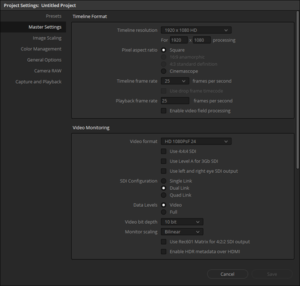 These are settings that are specific to the project you are creating and include things such as the timeline resolution, optimized media settings, color management, camera RAW settings etc. We will come back to these in a later blog – but now you know where they are. 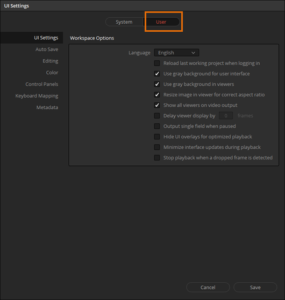 The other place to find important settings is in the ‘Preferences’ which can be found under the ‘DaVinci Resolve’ Menu diagonally opposite the cog icon – top left. There are 2 pages in this panel, System and User. 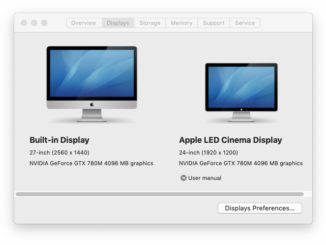 The system preferences look at things like the hardware of your system (GPU), where you will be saving important project items and using various external hardware panels for color and audio. User Preferences are about how you want resolve to work for you and include things like Auto Save options, how long transitions and still images should be in your timeline and customizable keyboard shortcuts etc. Again, we will come back to these from time to time in this series as we need. But before you shut this down, go to the ‘System’ tab of the preferences and go down to ‘Media Storage’. This is where you set-up where various things like cache files should be saved – and, if you have a fast disc drive on your system, it would be wise to set that as the first location in this list. To do this, click the ‘Add’ button and then navigate to the place you wish to use for cache and stills and then if you need to get rid of a previous entry, select that and hit ‘Remove’. 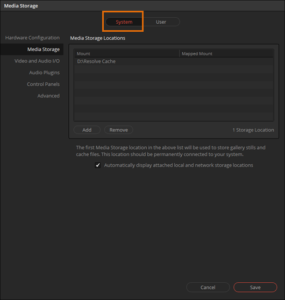 It is important that your selection is top of the list as this is the prime place DaVinci Resolve will choose to save these files and this may have an influence as to how fast DaVinci Resolve works does certain things. 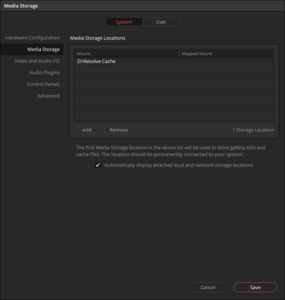 As you can see from the image above, I have chosen a second SSD drive on my machine and created a dedicated folder on that drive for DaVinci Resolve Cache so that I am clear where it is on my system. Note also that the ‘Automatically display attached local and network storage locations’ check-box is selected so that any and all drives on my system will display. Now we’re ready to start previewing and importing our media into our DaVinci Resolve project. Okay, so the big problem I am seeing with all these tutorials ist that they begin with the media already ingested (on a local hard drive). 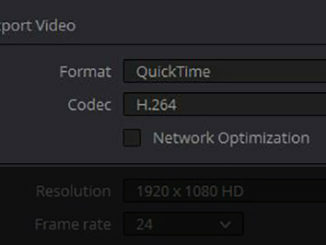 Some NLE’s have an ingest feature but no one mentions how to bring media on board with Resolve, just how to bring it into the project. Can you direct me where I can find something on that?